DEFINITION: What are Learning Targets in an arts integration PD experience? Learning targets articulate what the teaching artist expects participants to know, do, and appreciate by the end of the PD experience. These targets guide the design of the learning experiences and focus the participants on the learning purpose. Learning targets may include a) essential question(s), b) enduring understanding(s), and c) objectives that address specific new knowledge, skills or dispositions. Contextual information (see Context) informs the learning targets which in turn guide the teaching artist’s facilitation choices. How can asking questions develop student creativity? How does careful observation enhance interpretation? How do the arts generate student engagement? Close observation sparks the imagination. The arts generate focus, energy, and delight. Together the EU and EQ help the teaching artist succinctly frame why the topic is worth studying. Finally, objectives express specific, expected short-term outcomes of the PD experience. Objectives generally fall into three categories – what classroom teachers will know, do, and be like as a result of their learning. Knowledge-based objectives refer to the specific content of a discipline. In an arts integrated PD experience, this may include knowledge from an art form as well as knowledge from another integrated subject. Knowledge includes elements, principles, history, theory and other know-able facts. For example, a classroom teacher may know the definitions of the B.E.S.T. elements of dance by defining body, energy, space, and time (see Resources). The teaching artist may also expect classroom teachers to develop performance skills, both within the art form and as an instructor of the art form (See Art Content). Often, classroom teachers need to develop the skills of an artist before being able to teach the skills to others. They practice dancing to teach dancing. They practice drawing to teach drawing. For example, a teaching artist may expect classroom teachers to demonstrate using a variety of body parts, shapes and actions through creative movement. However, classroom teachers also need to practice the skills involved with how to teach the arts – how to prompt, question, probe, coach, and assess, among many other skills teachers need, to be agile as arts integrators (see Facilitation). A teaching artist might expect classroom teachers to provide coaching during a creative movement exercise by describing how their students are using their bodies. Ideally, a classroom teacher leaves the PD experience with new dispositions, or values and beliefs, that help them interact with their students as an artist would. For example, artists often see the value of failed attempts, mistakes that lead to discoveries, and errors that support more risks. If a teacher can learn to see failures as opportunities, he or she is practicing the temperament of an artist. In addition, teachers cultivate the same dispositions they want to nurture in children. For example, during a PD, teachers might explore and experience situations that require empathy in order to develop student empathy later within their classrooms. Learning targets drive decision making. This is the heart of backward design: to begin with the end in mind means to start with a clear understanding of your destination. It means to know where you are going so that you understand where you are now so that the steps you take are always in the right direction. PURPOSE: Why are Learning Targets important to an arts integration PD experience? In the art of backward design, the learning target is the final destination. Knowing the end point is the first step in creating a map that supports the journey to get there. Wiggins & McTighe (2005) often discuss the “twin sins” of design. One sin occurs when the instructor is activity oriented and provides hands-on experiences that are fun in the moment, but fail to intellectually engage the learner. The second sin occurs when an instructor focuses on coverage, driving to introduce every fact or figure related to a subject. In this case, there is not enough time for the learners to make personal connections or socially construct understandings, and the information may quickly crumble. A PD experience constructed with strong learning targets frames experiences with power and purpose. 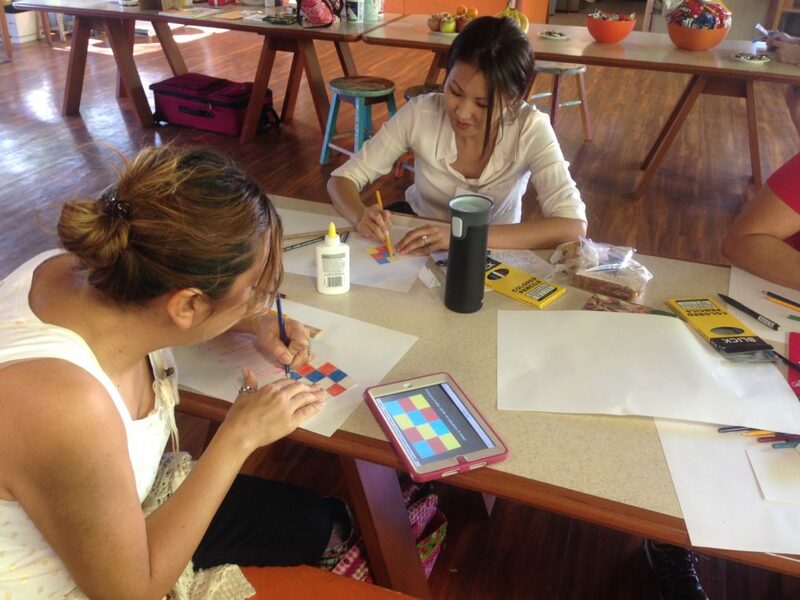 IN PRACTICE: How might Learning Targets be applied to an arts integration PD experience? Determining learning targets is ultimately about committing to priorities. A teaching artist carries a wealth of knowledge and experience that most classroom teachers do not have, but it is impossible to present the archive of a life’s work within a single PD experience. Articulating learning targets is about curating and focusing on an intentional collection that hangs together like paintings in a gallery. Consider selecting a few, focused learning targets that work together to support classroom teacher practice and their students’ learning. A PD experience designed around a single essential question supported by only three interconnected objectives could potentially be more powerful than one focused on a long list of tangentially related knowledge, skills, and dispositions.